Compatible Model List (1 of 4) : AI-S 28mm f/2.8 (Manual Focus), AF 28mm f/2.8D. Compatible Model List (4 of 4) : AF 35-80mm f/4-5.6D, LW 28mm f/2.8. ▷ Fuel / Oil Hose. Type : Lens Hood. ♢ Lens Cap. Nikon Zoom-NIKKOR 28-70mm f/2.8 AF-S D IF M/A ED Lens. Includes UV filter. Nikon Zoom-NIKKOR 28-70mm f/2.8 AF-S D IF M/A ED Lens. Includes UV filter.. Condition is Used. Dispatched with Royal Mail 1st Class. Compatible Model List (2 of 2) : AF 35-105mm f/3.5-4.5D IF. Compatible Model List (1 of 2) : AF 35-105mm f/3.5-4.5S. 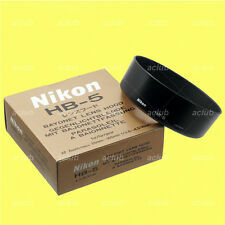 Nikon HB-5 Bayonet Lens Hood. ▷ Fuel / Oil Hose. Type : Lens Hood. ♢ Lens Cap. ♢ Stainless Steel Braided CPE. Few small marks to hood. GOOD: 80-89% of original condition - shows moderate wear for the age of the item. FAIR: 70-79% of original condition - shows more than average wear for the age of the item. Item condition. Compatible Model List : AF 28-105mm f/3.5-4.5D IF. 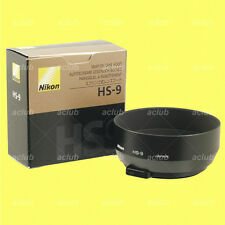 Nikon HB-18 Bayonet Lens Hood. ▷ Fuel / Oil Hose. Type : Lens Hood. ♢ Lens Cap. ♢ Stainless Steel Braided CPE. ♢ Stainless Steel Braided PTFE. ♢ Lens Hoods/LCD Hoods. Page Title. We are based in Japan/Hokkaido the northest part of Japan. Middle East. GOOD: 80-89% of original condition - shows moderate wear for the age of the item. FAIR: 70-79% of original condition - shows more than average wear for the age of the item. Item condition n/a general item condition. This lens hood 52 mm filter thread fits 2.8 / 28 lens for the Nikon. Marke Nikon. Compatible Model List : AI-S 50mm f/1.4 (Manual Focus), AF 50mm f/1.4D. ▷ Fuel / Oil Hose. Type : Lens Hood. ♢ Lens Cap. ♢ Stainless Steel Braided CPE. ♢ Stainless Steel Braided PTFE. ♢ Lens Hoods/LCD Hoods. GENUINE VINTAGE NIKON HS-4 METAL SNAP ON LENS HOOD FOR NIKKOR 105mm & 135mm . Condition is Used. Dispatched with Royal Mail 2nd Class. In reasonable condition overall. Some signs of wear and a few areas of paint loss. (This hood is custom fit so will attach ONLY to the Nikon 70-300mm F4-5.6 Zoom lens, it will NOT fit any other lens. Nikon HB-26 Lens Hood. Will this Hood fit your Lens. Hood only. I hope to see you back soon - enjoy your photography:). [EXC+++++]Genuine Nikon HS-9 metal Lens hood for 50mm F/1.4 lens from Japan !! Tiny scuffs from normal use. ■ Bundled Item. It shows signs of use. ■ Appearance. You can enjoy taking photos with the lens in good condition. Grade: Excellent . I will provide courteous and responsive service. 1 Nikon HN-23 Lens Hood fits 85mm F1.8 & 80-200mm F4 Lenses - vgc I have a large quantity of these hoods which all are in very good condition despite the usual slight knick or pitting to rim. ..but I assure you they are great. Each hood will be boxed to protect it during shipping. Thanks for looking ! In good condition, genuine working item. Nikon Lens hood is in excellent condition. Fully functional. There are a few minor scuffs and scratches on the surface, and there's a bit of paint missing around the HS-4 lettering. There's also a bit of scuffing on the end of the barrel. Compatible Model List (2 of 2) : AF 50mm f/1.4D, AF 50mm f/1.8D, AF 50mm f/1.8S, AF 50mm f/1.4S. Nikon HR-2 Screw-In Rubber Lens Hood. Compatible Model List (1 of 2) : AI-S 50mm f/1.2 (Manual Focus), Noct 58mm f/1.2 (Manual Focus). A genuine Nikon Lens Hood HB-26 twist and lock fitting in black finish to fit the AF Zoom Nikkor 70- 300mm F4-5.6 Lens, in good condition. NIKON HB-26 LENS HOOD. Compatible Model List (2 of 2) : AF-P DX 70-300mm f/4.5-6.3G ED VR. Compatible Model List (1 of 2) : AF-P DX 70-300mm f/4.5-6.3G ED. Nikon HB-77 Bayonet Lens Hood. ▷ Fuel / Oil Hose. Type : Lens Hood. Compatible Model List (3 of 3) : AF-S DX 55-200mm f/4-5.6G ED VR II. Compatible Model List (1 of 3) : AF-S DX Micro 85mm f/3.5G ED VR. Compatible Model List (2 of 3) : AF-S DX VR 55-200mm f/4-5.6G IF-ED. I will do my best to answer promptly. No warranty. Genuine Nikon HN-3. 52mm Screw-in Lens Hood. Exc++++. Nikkor 35mm, 55mm Micro. Nikon 35mm f/1.4 AI-S ,35mm f/2.8, 55mm f/2.8-3.5 Micro and 35-80mm D-AF lenses. Excellent condition. Paint very good. A few minor scuffs. Thread perfect. 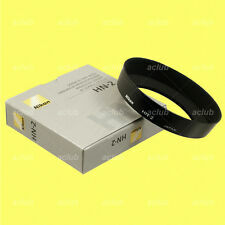 Nikon HN-1 Lens hood for Nikkor 24mm with 52mm filter thread. Good condition, working order genuine part. Nikon HN-33 lens hood. Nikon HB-27 Bayonet Lens Hood. Compatible Model List : AF 28-100mm f/3.5-5.6G. ▷ Fuel / Oil Hose. Type : Lens Hood. ♢ Lens Cap. ♢ Stainless Steel Braided CPE. ♢ Stainless Steel Braided PTFE. ♢ Lens Hoods/LCD Hoods. Compatible Model List (3 of 3) : AI-S 35mm f/2.8 (Manual Focus), Micro 55mm f/2.8 (Manual Focus). Compatible Model List (1 of 3) : AF 35mm f/2D, AF 35mm f/2S, AF 35mm-80mm f/4-5.6D. Compatible Model List (2 of 3) : AI-S 35mm f/1.4 (Manual Focus), AI-S 35mm f/2 (Manual Focus). We do our best for you!! [ Li-ion Battery ]. [ Multiple sizes and colors ]. Japan Usage Item. [ Electronics ]. As new in original box. Compatible Model : AF-S 24mm f/1.8G ED. Nikon HB-76 Bayonet Lens Hood. ▷ Fuel / Oil Hose. Type : Lens Hood. ♢ Lens Cap. ♢ Stainless Steel Braided CPE. ♢ Stainless Steel Braided PTFE. ♢ Lens Hoods/LCD Hoods. Wide Free! 2-4 Weeks No. I will respond in good faith. >>>Depending on the location. 1￡ 1-3 Weeks Yes! Dont expect to see crystal clear optics if you shine a torch through an old lens! This is a sure fire way to encourage fungi! If you want perfection. Buy a new one. Its as easy as that! You will see internal reflections/ghosting etc. Compatible Model List : AF 80-200mm f/2.8D ED. 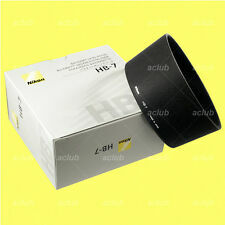 Nikon HB-7 Bayonet Lens Hood. ▷ Fuel / Oil Hose. Type : Lens Hood. ♢ Lens Cap. ♢ Stainless Steel Braided CPE. ♢ Stainless Steel Braided PTFE. ♢ Lens Hoods/LCD Hoods. Original Nikon lens hood for 35-105mm etc Nikon lenses. Nikon HB-2 Original Lens Hood. A must for the Nikon owner. - Used but Good. 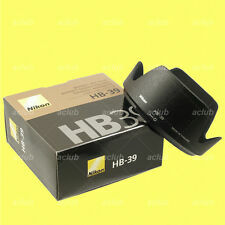 Nikon HB-38 lens hood. Actual photos of the item you will receive. Unused since and supplied in new plain white box. Compatible Model List : AF-S DX 17-55mm f/2.8G IF-ED. Nikon HB-31 Bayonet Lens Hood. ▷ Fuel / Oil Hose. Type : Lens Hood. ♢ Lens Cap. ♢ Stainless Steel Braided CPE. ♢ Stainless Steel Braided PTFE. Compatible Model List : AF 20mm f/2.8S, AF 20mm f/2.8D. Nikon HB-4 Bayonet Lens Hood. ▷ Fuel / Oil Hose. Type : Lens Hood. ♢ Lens Cap. ♢ Stainless Steel Braided CPE. ♢ Stainless Steel Braided PTFE. (6092) Nikon HN-24 Lens Hood for AF 100-300, 70-210, 75-300 from JAPAN, EXC+!! (6092) Nikon HN-24 Lens Hood for AF 100-300, 70-210, 75-300. 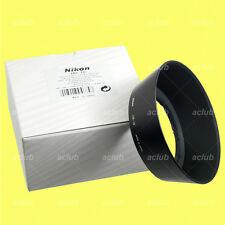 Nikon HN-24 Lens Hood for AF 100-300, 70-210, 75-300Only. EXC condition. Made in JAPAN. It has a wear with regular specification. Our Products are 100% Authentic. Nikon Nikkor 24-70 mm f/2,8G ED AF-S. Lens Hood for NIKON [HB-40]. The lens hood prevents light reflections. It is made of high quality plastic. 1x Lens hood. THE SET INCLUDES 100% perfect fit. YOU MAY LIKE. Dedicated bayonet lens hood specifically engineered for Nikon AF-S NIKKOR 50mm. In less-than-ideal lighting conditions, the performance difference can be substantial. We will always help you to have a 100% positive happy buying experience. Compatible Model List (1 of 2) : AI-S 24mm f/2.8 (Manual Focus), AI-S 28mm f/2 (Manual Focus). Compatible Model List (2 of 2) : PC 35mm f/2.8, AF 24mm f/2.8D, IX 20-60mm f/3.5-5.6. ♢ Focusing Screens.